Cowabunga, dude! We've always wondered what that means, but then we end up having so much fun saying it that we forget to look into it! Now your little one is going to have a blast saying this awesome catchphrase, too, while pretending to be his favorite “Hero in a Half Shell” in this Toddler TMNT Michelangelo Costume! Michelangelo (or Mikey, as his buddies call him) may be best known as the radical party dude in the hit Nickelodeon series Teenage Mutant Ninja Turtles. He can usually be found skateboarding through the sewers, playing pranks on his older bros, or catching up on some video games, but no matter what he's up to, he's probably munching on a slice of pizza while he's at it! 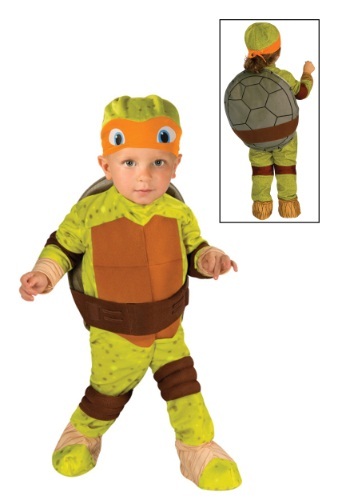 Mikey may seem a little immature compared to the other Turtles, but he's just a little younger and smaller, and he makes up for his lack of experience with his enthusiasm and creativity. He's even been known to come up with some pretty kookie plans to help solve problems the Turtles get into, but if those don't work, he busts out his fierce nunchuck skills!